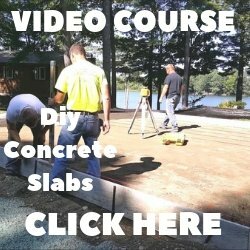 Concrete Countertops - Learn about building, polishing, sealing and more. Concrete countertops are being installed in kitchens, baths, restaurants, pubs, and everywhere else a more traditional countertop would normally be used. A concrete counter top offers many unique qualities that other materials can't. 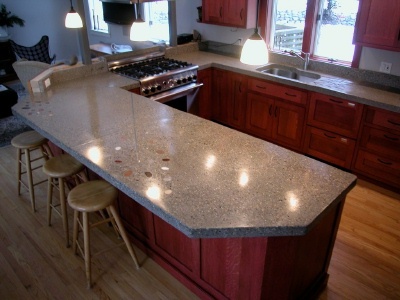 As you can see below, this countertop built using concrete had some special aggregate broadcast into it and polished to a smooth finish giving it a personalized appearance. Check out the bottom of the page for all kinds of great information. Photo's courtesy of Jon Meade Design of Freeport, Me. 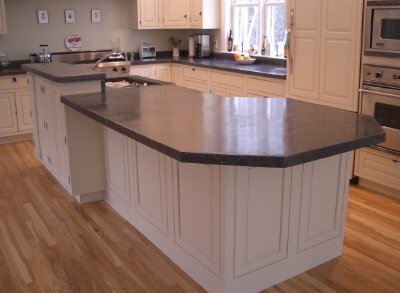 Why are countertops built using concrete so popular? Here you can learn about how to make their versatility work for you, how they're built, what color options are available, how they're designed and created, and what amazing finishes are available. Having concrete as a countertop offers you something unique, that is hand crafted. Most homeowners like the fact they have a one of a kind countertop, they took part in designing, picking out colors, the type of finish, integrating objects into the surface, and shaping. Each hand crafted cement countertop can be designed to appeal to you, the owner, and fit the overall decor of your home or place of business. There are some concrete artisans that are very creative. I'll show you some designs to give you an idea of what is possible with concrete as your countertop. I think you'll be blown away by the possibilities. The cost of concrete counter-tops will vary between contractors for various reasons like thickness, design, shapes, size, finishes, colors and whether it's poured in place or precast in a shop. The average price should run you around 50 to 100 dollars per square foot of countertop, that should include installation. You can also try to build the countertop yourself for much less cost. 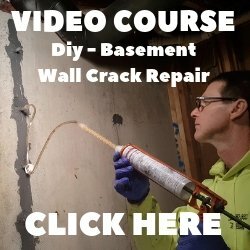 I have a diy concrete countertops page to show you how. Here's the ingredients for a concrete countertop mix if you're thinking of making one from scratch and for beginners, an even more simple concrete countertop mix. Take a look at what I recommend for the best sealer for concrete countertops.